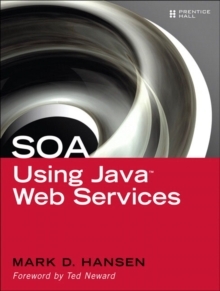 Expert Solutions and State-of-the-Art Code ExamplesSOA Using Java (TM) Web Services is a hands-on guide to implementing Web services and Service Oriented Architecture (SOA) with today's Java EE 5 and Java SE 6 platforms. Author Mark Hansen presents in explicit detail the information that enterprise developers and architects need to succeed, from best-practice design techniques to state-of-the-art code samples. Hansen covers creating, deploying, and invoking Web services that can be composed into loosely coupled SOA applications. He begins by reviewing the "big picture," including the challenges of Java-based SOA development and the limitations of traditional approaches. Next, he systematically introduces the latest Java Web Services (JWS) APIs and walks through creating Web services that integrate into a comprehensive SOA solution. Finally, he shows how application frameworks based on JWS can streamline the entire SOA development process and introduces one such framework: SOA-J. The bookIntroduces practical techniques for managing the complexity of Web services and SOA, including best-practice design examples Offers hard-won insights into building effective SOA applications with Java Web Services Illuminates recent major JWS improvements-including two full chapters on JAX-WS 2.0 Thoroughly explains SOA integration using WSDL, SOAP, Java/XML mapping, and JAXB 2.0 data binding Walks step by step through packaging and deploying Web services components on Java EE 5 with JSR-181 (WS-Metadata 2.0) and JSR-109 Includes specific code solutions for many development issues, from publishing REST endpoints to consuming SOAP services with WSDL Presents a complete case study using the JWS APIs, together with an Ajax front end, to build a SOA application integrating Amazon, Yahoo Shopping, and eBay Contains hundreds of code samples-all tested with the GlassFish Java EE 5 reference implementation-that are downloadable from the companion Web site, http://soabook.com. Foreword Preface Acknowledgments About the Author Chapter 1: Service-Oriented Architecture with Java Web Services Chapter 2: An Overview of Java Web Services Chapter 3: Basic SOA Using REST Chapter 4: The Role of WSDL, SOAP, and Java/XML Mapping in SOA Chapter 5: The JAXB 2.0 Data Binding Chapter 6: JAX-WS-Client-Side Development Chapter 7: JAX-WS 2.0-Server-Side Development Chapter 8: Packaging and Deployment of SOA Components (JSR-181 and JSR-109) Chapter 9: SOAShopper: Integrating eBay, Amazon, and Yahoo!